Amsadong is a neolithic site whose earliest level dates to the Fourth Millennium, ca. 4000 BC - 3000 BC. The site is located in southeast Seoul, and was exposed by flooding in 1925. 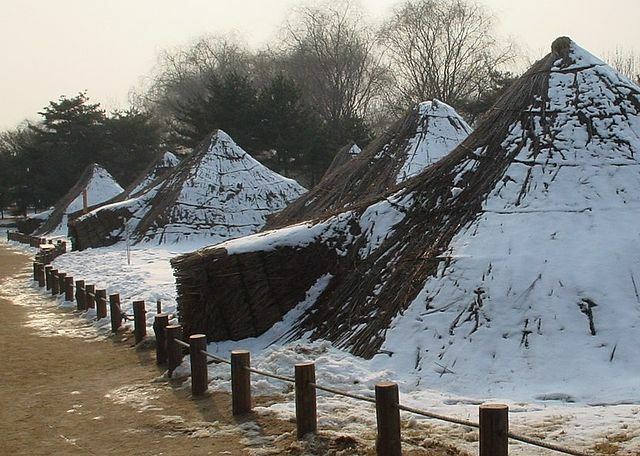 After excavation, Amsadong was turned into a sort of theme park by which visitors could experience a re-creation of life in the prehistoric village. There are three distinct layers of occupation at Amsadong. The earliest and most important is dated 4000 BC - 3000 BC, as mentioned above. It contained about 20 pit-houses and quantities of typical Jeulmun comb-pattern pottery. The middle layer yielded undecorated Mumun ware. The upper layer is Baekje, and included remnants of jar-coffin burials and stone houses. Neolithic remains from the site include the above-mentioned comb pattern pottery, and stone tools such as axes, arrowheads, scrapers, and fishing net weights. There were also acorns and grinding stones, hand-held ploughs, and stone scythes. These remains indicate that hunting, gathering, and incipient agriculture were all practiced at Amsadong during the 4th millennium BC.